The printed canvases finally arrived… and they are stunning. I am so pleased with the clear and accurate colours and printing. This pictures do not do them justice. The wool had been sorted, counted and arranged into bundles (they are called dollies in Appleton’s language) while I was waiting for the canvases to arrive. 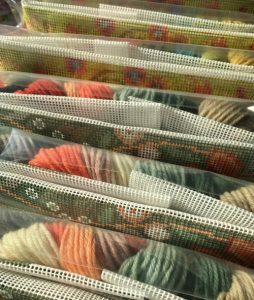 It didn’t take long to make up the first batch of tapestry kits. So the three new Designs; Painted Pony, Painted Elephant and Dancing Teddies are the latest editions to my catalogue and are ready to meet their public! Finally, if you have cupboards and drawers full of left over wool from other kits, this is the way to recycle! Another new page – Just the Canvas, where that is exactly what you get! Just a printed canvas at a rock bottom price, so you can use up your stash of wool to make something unique; your very own One Off! By the way – I have no idea why this paragraph is over here on the right; it refuses to go anywhere else!